Welcome to my tutorial on how to Install Android Development Tools. I received many requests on how to do this and it is a great topic to cover right before I start my Android Development Tutorial. I’ll cover how to install Googles ADT plugin, all of the common errors people get and take you through running your first app. Many important things need to be pointed out like the fact that Googles emulators are terribly slow. If you haven’t installed Eclipse yet, definitely checkout my tutorial Install Eclipse for Java first. hope it will it be a short game App… a Androids Asteroids Game perhaps. please i don’t get it the download thing i mean can you please help me get another simple way to download it. and am a beginner i love you python programming lecture is more advance. why wont you use netbeans 7.3? I the IDE I use in tutorials is normally the one I found easiest to install on every OS. I found Eclipse was easier to install then NetBeans. I’ll be starting my Android game tutorial soon. Everything I make will be 100% free. You really kind and thank you… i really love your work it is very nice… thank you man really am. Thank you very much for the nice compliments 🙂 I greatly appreciate them. I had an error. It says location of the Android SDK has not been set up in the preferences. What do I do? I’m looking forward to these tutorials. Will be watching them and hopefully developing Android apps soon! When i run the hello world application, the emulator runs but then i never get “hello world!” printed on the screen, and the screen shows this text: “charging 50%”. What can i do to fix this ? I came across your tutorials and I really like them. Looking forward to see some real application development examples. Thank you for sharing the knowledge with the Android community. I really appreciate. i have already installed ecpilse and android enumlater ,but of old version. So i should remove it or go for upgrade??? Tell me what should I do . I am learning Java from “Head First Java” . Should I also watch your Java tutorials first ?? Derek, many thanks for the Java, Android tutorial series. I had Eclipse installed previously and it had worked flawlessly. However, after having installed Android Studio recently, the Eclipse stopped working (couldn’t find java). I’d tried to reinstalled Eclipse following your steps, however, now I just got Eclipse flashing for a second, then nothing happened. The 2nd time on, nothing happened. I also tried to uninstall Android Studio and then reinstalled Eclipse, but still cannot start Eclipse. Joe, You are very welcome 🙂 I’m happy that you are enjoying the tutorials. Yes Android Studio is a nightmare and it will probably continue to be so for some time. I have 2 tutorials that should set everything straight. Look at Install Eclipse for Java and then Solving Android SDK Problems. Together they should fix everything up. Thank you very much for your tutorials. They are great!! My problem is that my Android Virtual Device (came along with ADT) runs very very slow. It takes about 5 minutes to start, and keeps terribly lagging then. I get this message. I am not able to complete the install. What are your thoughts? Thanks!! Cannot complete the install because one or more required items could not be found. I followed the instruction and so far the only problem I see is that, the “status” column in Android Device Manager has different icon for “Installed” packages. The check icons in front of the word Inslled are all red instead of usual green. Is this a problem? Great tutorials you have. The best I’ve ever seen! What I’d really like to see as a tutorial is what to do if I already have an .apk file (from an app building site) and all I need to do is preview it on the emulator – what software to download and use just for that purpose. Apologies, but I’m totally lost with this. And how would I load the unzipped .apk file into the emulator (looks like several files unzipped)? This guy developed a stand alone Android Emulator that may help? why eclipse not Android Studio?
. Pls I need your help. This application has requested the Runtime to terminate it in an unusual way. Please tell me what should I do. Hello..Great work with your tutorials..
What do you mean I don’t have to download sdktools from google? ADT-plugin doesn’t install.. that’s why everybody can’t find the SDK location.. The link for the plugin download os broken – can you supplay another one insead? Thanks in advance and keep up!!! Hey, got the bug where I couldn’t finish setting up the Android Virtual Device but when I went into the Android SDK manager the Mips System image isnt stated under Android 4.3 and when selecting an Android version to base the virtual device off that is the only version I am allowed to choose. What should I do? As a heads up all I had to do was restart eclipse again. Thanks anyway. First of all i would like to thank you very much for every thing you publish here in your site … everything is simply useful. i don’t have too much experience in JAVA, but i’m taking your Java Tutorial these days. do i need to finish the whole Java tutorial before i begin in Android development tutorial? i really love to be an Android Developer… Any advice ? and thank you in advance. Thank you for all the kind compliments 🙂 I very much appreciate them! You don’t need to watch all of the Java tutorials for Android. You need 1 – 7, 9, 11 -﻿ 13, 17, 18 and parts 1 and 2 of my design patterns tutorial. Watch parts 1 and 2 of the design patterns tutorial after part 9 of Java and you’ll be ready for Android. Here is my Java Video Tutorial and here is the Design Patterns Video Tutorial. I hope you find them useful. Thank you 🙂 You’re very kind. what do you think about the (MIT app inventor)? i’m studying the tutorials and planing to continue. Hi, I haven’t looked at the course, but I’m sure it is probably very good. I think it is a great idea to watch tutorials and read articles from many different sources. Stick with Android and you’ll get it. It is only complicated in the beginning. Thank you 🙂 I’m glad it helped. Thanks for the huge effort you’ve put into making such great Android tutorials. I just can’t get enough of watching them and following along. They are definitely the exact kind of thing to get me going with Android app development. I consider your tutorials to be the best thing around in this field, especially when it comes to getting started from nothing. i did everything the tutorial said but when i restart eclipse to start a new project it says i need something called SDK. i don’t know what that is and you don’t seem to get that message in your video so i was wondering if you could explain what i should do.. In Eclipse Click Window – SDK Manager. You’ll find the location of your SDK there. Hey Derek , thank u for all this great tutorial , really appreciate your amazing effort , i wanna be a professional in the android Development where i must start? is java and xml necessary and if yes for any level ? Thank you 🙂 You basically need to understand the basics of Java. If you watch parts 1 – 7, 9, and 11 through 18 of my Java video tutorial you should be ready to go. You don’t need to be an expert at using XML, but I have an XML tutorial if you’d like to look at it. I wish you the best! Is it same for linux? Yes the Linux install is very similar to Mac. Another fine tutorial. My compliments. I am looking to develop iOS applications on a Linux platform. If this capability becomes available, I would apprecite tutorials on that subject matter. Thanks for the great tutorials Derek. Please contact the application’s support team for more information. I followed the steps and got the emulator to run, but I don’t see the Hello World display. When I unlock the screen it just takes me to the Android main screen where I can scroll around. I’m thinking it might be the package name I used when creating the project. I didn’t have a web address so I also just used com.newthinktank.helloworld. Would that affect it? Take a look at part 26 of my Android tutorial. I show how to install all of the newest tools in it. Thanks a lot for your tutorials. You recommend to use Eclipse Indigo, what about the new versions of Eclipse like Kepler ? You’re very welcome 🙂 Here is my tutorial on installing the newest Android / Eclipse. I hope it helps. Go to Preferences->Android and browse to your SDK folder. You may also want to try my new tutorial in which I cover how to install the newest Android tools. the emulator it says Failed to install kkkokkojjj.apk on device ’emulator-5556! do you know how to fix it? I cover how to install all the new Android tools in this tutorial. That should fix your problem. 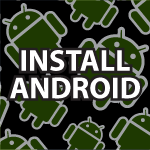 I have a new tutorial on how to install the newest Android tools. Can I use eclipse juno or kepler, or i have to use indigo for your tutorial? I cover how to install the recommended tools in this tutorial. I already have eclipse Kepler on my computer. Is there specific reason to use indigo or shall I continue using Kepler. Not sure what all these version mean. You can ignore both my earlier questions. I think I solved the problem after I downloaded and unpacked the SDK from the developer website. Thanks. Do you no why this is happening? Do you have a tutorial on how to convert websites to android application.? I really appreciate what you are doing.Your tutorials really are helpful…I thank you so much and keep up the good work.